A busy man of late, Jorn Lande is back with his newest solo album, his fourth. The Duke comes fresh off the heels of his highly regarded collaboration with Russel Allen and the Aeronautics albums of Masterplan (Jorn has since left this band.). The Duke sees Jorn head off in a slightly different musical path than either of the two aforementioned albums. This album is heavier, and more in your face than Jorn's most recent work. Jorn has enlisted the services of Morty Black (TNT) on bass, Willy Bendikson (Company of Snakes) on drums, and guitarists Jorn Viggo Lofstad (Pagan's Mind) and Tore Moren (Carnivora) to play on this album. As opposed to the melodic hard rock of Aeronautics and The Battle, Jorn is going for a classic melodic metal album with The Duke. The keyboards are pretty much gone, and the music has a much harder edge, as does Jorn's voice. The obligatory Coverdale / Dio comparisons to Jorn's voice are even more apparent on this album. Unfortunately, I do think the first half of the album is far superior to the second half. The Duke starts off with some killer tracks, but the drop in quality level is very evident to me once I reach the second half. The opening track, We Brought The Angels Down is slow, but very heavy track that really puts Jorn's vocals in the spotlight. The chorus line is highly memorable, and Jorn's eccentric delivery really drives the melody home. The riffing is slow and crunchy, but heavy and very precise. I found this to be an odd choice for an opening track, but it works. Blacksong follows with a more uptempo track. Again, the guitar work is very heavy and forceful, but without galloping at a furious pace. A flashy guitar solo in the vein of Zakk Wylde (from the late 80's to early 90's Ozzy material) is a highlight of this track. Morty's prominent presence on bass really helps give the songs that solid and heavy foundation throughout the album. Stormcrow follows up, and this is a straight forward classic metal anthem very much in the vein of Dio here. Some technical, but very tight guitar work combined with a simple, but catchy chorus line carried by Jorn's soaring voice steal the show. End Of Time and Duke of Love are mid tempo metal songs with a nod toward hard rock. Both feature instantly recognizable melodies that are driven into your head with ease thanks again to Jorn's masterful vocals. As with the aforementioned songs, some very well done, expressive guitar solos can be found in each song. Duke of Love has more of a "sing along," fun vibe to it, while End of Time has a slightly more dark and serious tone to it. The second (and inferior, in my opinion) half of the album kicks off with the first of two ballads, Burning Chains. The song is a decent ballad, but I've definitely heard better from Mr. Lande. Of note, this song ends with an acoustic backed, soulful vocal passage from Jorn. It's amazing how similar Jorn sounds to David Coverdale when singing in this particular style. Two midtempo tracks, After the Dying and Midnight Madness follow. Neither one is of the same quality of the material that can be heard earlier on the album. The special "something" that makes a song memorable just isn't present with these tracks. Of course, the musical performances and Jorn's vocals are in fantastic form, but the songs just fail to jump on me, even after repeated listens. A cover of Thin Lizzy's Are You Ready is next, a well done metalized version of the original. Still, it is a cover tune, and for me, covers have very little lasting value for me. The album concludes with Starfire, another decent to good, but unspectacular track that features some of Jorn's most passionate and expressive vocals of the album. The song features more of the heavy, but midtempo guitar work that is present on much of the album. A couple of excellent solos can be found, but again, the song arrangement itself is lackluster. The Duke certainly features some very strong moments, something that Jorn Lande fans have become accustomed to over the past few years. Unfortunately, the level of quality is not consistent from start to finish, with the album really losing steam of the last half for me. Jorn has enlisted some very talented musicians to lend a hand with this album, and as I've pointed out a few different times in this review, the individual musical performances reflect that. 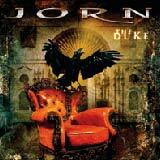 Furthermore, Jorn's voice is as strong as ever, with some of the heavier music really bring forth that raw power and emotion that the man has to offer. Based on that, I cannot say that any of the songs on this album is bad or a throwaway. However, the difference in vitality and lasting power between the killer songs of the album and "the rest" is very notable to me. I would best classify this as an album that starts off with a handful of excellent tracks, but fades into a collection of so-so to just good tracks.